LINCOLN: Sara Zaltash reports from the second instalment of a festival that's bringing digital culture to the steeply cobbled East Midlands streets. My quest to discover all that was and might be a blast of digi-tech creativity in the iron-age cathedral city of Lincoln began blearily in the capital-age cathedral domes of the newly renovated King's Cross, on a train reaching northwards across the morning hours like a strong black Americano. To say that the biennial Frequency Digital Culture Festival had pinned this once military-industrial stronghold onto my cultural map would be as simpering an understatement as recognising that online shopping has affected Britain’s high streets. Thankfully, I was delighted to discover that the same cyber hand that taketh away old traders’ rights is now giving back left, right and centre on the canvas of the city. The broadest spectrum of digital culture is being broadcast across the city to transformative effect. “Revolution”, the theme of this year’s Frequency, is more than just an interface offered from left-of-centre survivalists. Premieres from event-tech luminaries like Blast Theory glide politically between Stanza’s social interventions of hoodied youths graff-tagging in binary code [above]. In high street pop-ups, the local Juneau Project spout dour sermons of an imagined post-digital apocalypse. 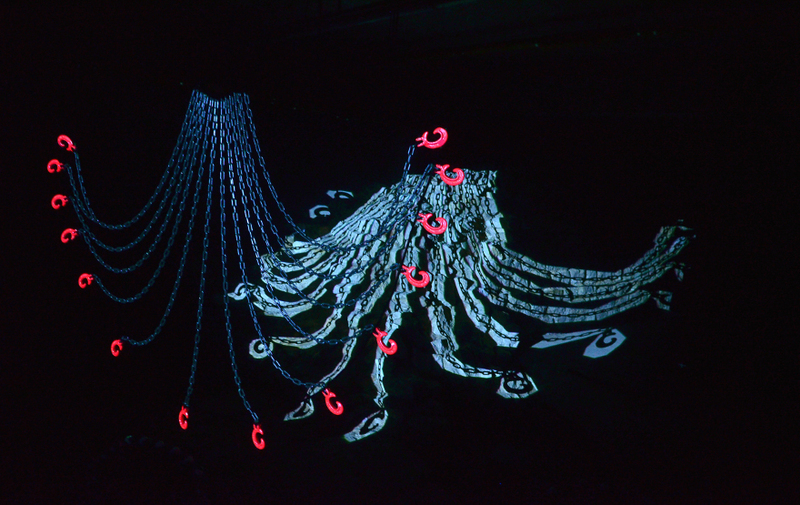 New collaboration, Trope, have transformed the damp basement of an RBS building into a diasynchronic playground of projected light and concrete and chains [below]. Immersive virtual experiences from multidisciplinary performance group Me and The Machine splice issues of social isolation and discrimination against immigrants with haptic disassociation and gaming references. Kurdish artist Jasim Ghafur’s wickedly witty video works stabbed at the heart of revolutionary conflict in the cellars of Lincoln’s Drill Hall. In institutions large, small and religious, the broadest spectrum of digital culture is being broadcast across the city to transformative effect. 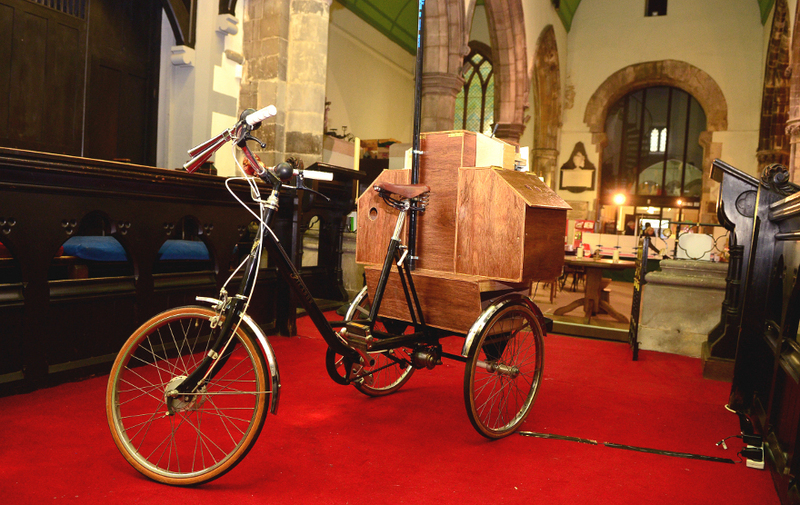 Navigating questions of old and new is Curio, a custom-made wooden tricycle and audio-visual digital gallery, created by local collective General Practice [above]. Inspired by 19th century wunderkammers, Curio’s intrigue hinges on the contrast of old-fashioned human-powered mobility and the intimate mundanity of pixelated digital data. A recording has been taken from a microphone attached to one wheel of the tricycle as it travelled around the city. Listening from headphones connected to the tricycle, I'm struck by how sympathetically and buoyantly sonic experience takes to being digitally documented. Digital capture and transmission has enabled those wheel clunks, squeaks and gyrations to take on a personality that wanted to natter away in my ear and tell me all its cobblestone secrets. It's to Frequency’s credit that within the constellation of projects is a smattering of critical dark stars. The work of American artist Brian House tells a similar tale as part of a high-hitting exhibition about maps for city flagship The Collection Museum. House’s works include Quotidian Record, a vinyl made by recording the artist’s location over an entire year and assigning a musical note to each bit of GPS data. The vinyl sings out across the entire exhibition like an 8-bit orchestra of the peripatetic mind, the harmonious assignments of location data structured rhythmically by the logbook of one year’s life. House’s other works in the exhibition poke more critically at the problems of privacy and truth that come with an abundance of data, a theme also spotted in the work of acclaimed British artists Stanza and Dave Griffiths, among others. It is to Frequency founder-directors Uzma Johal and Barry Hale’s credit that space has been made within the constellation of projects at the festival for a smattering of critical dark stars. For me, Frequency's twin highlights come from two mind-blowing projects by Chris Levine and Alexis Rago. 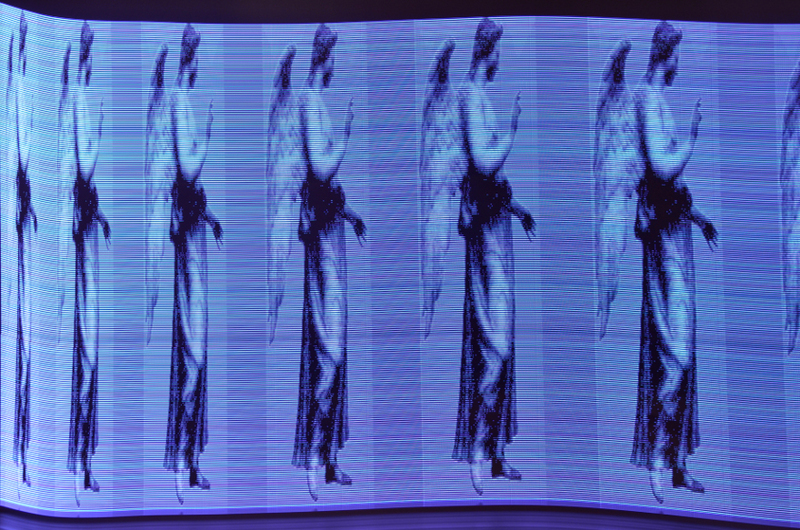 Levine’s Angel Presence [above] follows on from his previous light installations, such as Now and Light is Love, by harnessing peripheral imaging LEDs to conjure figures in a beam of light when the viewer shakes their head from side to side. Upright and celestial in the chancel of St. Swithin’s Church, Levine’s light work is breathtakingly simple and awesome. What better way can there be to express the concept of an angel than through the pure expression of a mathematical truth, as a light-being that flickers at an invisible frequency, a being that can only be seen by entranced attendees waggling their skulls from side to side? Rago’s Chaos Contained, meanwhile, is the largest exhibition of a single artist’s work in the festival [above]. Against a backdrop of enlarged pinhole camera images of nature, each image a time-dilated critique of quick-press digital culture, Rago’s microscopically detailed sculptures in clay hark towards a future religious iconography. One piece, “time passes by but things stay the same”, lays hyper-contrasted video projections of natural surfaces like water, leaves and sky over one of the artist’s signature chandelier-esque clay forms that stands precariously on its vertical axis. Where the projection spills out messily over the plinth and onto the floor below, the sculpture stands magisterial, eclipsing the light thrown out from the digital glare, containing the absence of materiality in its shadow. There is so much more going on at Frequency than I could cover here, and with groundbreaking secret plans already underway for the 2015 edition, there's a pretty good chance that Lincoln, the steeply cobbled East Midlands treasure that motorways forgot, might just become the destination for digital culture in the UK. Frequency is taking place in Lincoln until 26th October 2013. Sara Zaltash is a British-Iranian live artist who creates song-based performances about transgression. 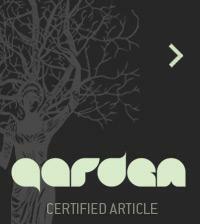 She is influenced by God, music, corruption and the non-linearity of time. Most recently, Zaltash swam to Bestival while singing a 100-verse ballad about the impossibility of changing fate, which you can read about here on Wild Culture.